Hand Crank Musical Movements. 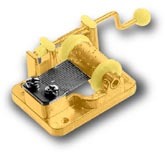 Any Yun Sheng melody offered on our website or catalog is available in a Hand Crank Musical Movement. MINIMUM ORDER is 200 pieces of a Tune. PRICE is F.O.B. our Warehouse. Orders must be "Prepaid". Please allow 4 months delivery time. You can choose from the Yun Sheng melodies listed in the 4 sections shown below. (Click on Selections to view). IMPORTANT: The only tunes currently available for these movements are those that are in the "Public Domain" (that is, those tunes that are not Copyright Protected). Crank extends 1-1/4" from frame.